A serious accident or devastating injury drastically can change the quality of a person's life for years to come, if not forever. Whether the accident was caused by negligence, unintentional carelessness, or even by intentional design, its lasting impression is hard to overcome as you continue on in your life. At the Lanier Law Group, P.A., you're bound to find the attorney who is best suited to your needs. With offices in 11 locations throughout the State of North Carolina, we can guarantee that there will always be someone to help you. INJURY ATTORNEY SERVING ALL OF NORTH CAROLINA The time following an accident is one of the most stressful, emotional times in one's life. There is absolutely no reason for you to have to face it alone. With the right North Carolina personal injury attorney at your side, that burden on your shoulders can be transferred so that you may have peace of mind. With our thorough, intimate knowledge of the law, we can usher you through these trying times. By taking an aggressive, dedicated approach to the success of your case, we will leave no stone unturned in our campaign to see you win maximum monetary compensation. Although most cases reach a settlement, we are not afraid to take it to civil court. There we can fight to potentially win you payment for physical, emotional and financial losses that you may have suffered because of the accident. We will fight for you. From slip-n-falls to serious injuries, we handle it all. Our attorneys successfully have resolved cases involving: Personal injury Auto accidents Medical malpractice Social Security disability Workers compensation Wrongful death Defective products liability Nursing home abuse Sexual abuse Our law firm handles personal injury claims and lawsuits for clients throughout all of North Carolina. We can work with you to identify what your claim may be worth and who or what party should be held legally accountable for your injuries. Though you currently may be going through a turbulent time, a North Carolina personal injury lawyer at our offices can help to guide and support you to assist you in moving on with your life to a brighter and more stable future. HELPING THOSE INJURED IN ACCIDENTS IN NORTH CAROLINA If you have been injured or involved in an accident in North Carolina, it is in your best interest to speak with a skilled accident lawyer as soon as possible. You have legal rights that may entitle you to compensation if you can prove your injuries stemmed from the negligence or carelessness of another. When working to rebuild your life after the devastation of an accident, it's impossible to erase all traces, but we can work to get your life as close to where it was prior to the accident or injury. The different aspects of your life touched by the accident, now and into the future, need to be compensated for - to the greatest extent of the law. At Lanier Law Group, P.A., we have almost two decades of experience handling personal injury claims, and we work tirelessly on behalf of our clients. WE PUT ON THE GLOVES TO FIGHT FOR INJURY VICTIMS IN NORTH CAROLINA We at Lanier Law Group, P.A. are prepared to fight tirelessly to help you obtain fair compensation if you have been injured in a truck accident. Our attorneys handle accident cases involving tractor-trailers, dump trucks, moving trucks and large trucks throughout North Carolina. We are ready to discuss your case and how we can help you. We have the experience and the resources to carefully investigate the circumstances that led to your auto accident and to establish the possible value of your claim. TIPS FOR AVOIDING A COLLISION WITH A TRUCK If you are a driver of a passenger car or a motorcycle, merely being near a large truck can be nerve wracking, and rightfully so an accident with one of these behemoths may cause catastrophic injury and even death. At Lanier Law Group, P.A., our attorneys handle truck accident cases daily. We know how North Carolina auto accidents occur. Here are some tips for avoiding them: Change lanes. Have you ever found yourself driving on the highway when suddenly a large truck begins tailgating you and flashing the headlights? The best thing to do in this situation is to change lanes and let the truck pass you. Never tailgate trucks. Tailgating a truck is dangerous. It can be hard to see traffic ahead, so you may not know when the driver will stop. If you rear-end a truck, it may result in serious injury or death. Stay clear of a truck's blind spots. If you find yourself in a truck driver's blind spot, safely change lanes. If a truck driver cannot see you, he or she may changes lanes and collide with your vehicle. Injury from an auto accident may affect your entire family. Our lawyers stand by your side and help you fight back. DEDICATED TO HELPING YOU RECEIVE BENEFITS Social Security Disability Insurance is intended for individuals who can no longer work because of a severe disability. With this government program, money is withdrawn from employees' paychecks and allocated to a fund for people not working because of their disabilities. Social Security Disability Insurance is monitored by the Social Security Administration, which reviews each case to ensure that truly only deserving people receive this financial support. QUALIFYING FOR SOCIAL SECURITY DISABILITY INSURANCE To receive Social Security Disability Insurance, an applicant generally must have worked for a specified amount of time and have a qualifying disability. A disability refers to any condition, illness or injury that affects a person's ability to work. Based on this definition, below are some examples of accepted medical conditions that may be covered under SSDI: Cancer Multiple sclerosis Chronic heart disease Mental disorders HIV positive Rheumatoid arthritis At Lanier Law Group, P.A., our attorneys have helped hundreds of people successfully file SSD claims, as well as claims for Supplemental Security Insurance, or SSI. Our compassionate attorneys can help you through the SSDI appeals process, explain why you may have been denied the first time you applied, and assist widows/widowers seeking SSDI for their future well-being. We have also helped clients throughout the state of North Carolina who were seeking total and permanent disability status, had questions about Medicare and Medicaid or had concerns about claiming SSDI over the age of 50. We've held our ground for clients seeking SSI for disabled children. We stood in their corner, and we'll stand in yours too. SOCIAL SECURITY DISABILITY ATTORNEY SERVING NORTH CAROLINA If you have a serious medical condition, likely to keep you from working during the next year, our team of experienced North Carolina Social Security disability lawyers can provide you with sound legal advice and trusted guidance in Burlington, Durham, Greensboro, Greenville, Charlotte, Asheville, Wilmington, Raleigh, Winston-Salem, Fayetteville and Jamestown. While the Social Security Administration often denies initial claims, you can trust us to work hard to further document the severity of your disability and file your appeal request within the 60-day period. Whether it takes six months or two years, we will remain steadfast throughout this often lengthy process and use all of our resources to help you receive any SSDI benefits you may deserve. GET THE FACTS ABOUT SOCIAL SECURITY DISABILITY INSURANCE If you are suffering from a serious disability preventing you from returning to work, you should know that you have options. Social Security Disability Insurance is one way of maintaining financial stability when you have been left unable to work, but filing for this type of insurance often proves to be a complex process. So it's important to understand if you are eligible for Social Security disability payments and what the benefits are. If you still have questions about the SSDI process or you want to retain a legal professional to assist you in filing for these benefits, do not hesitate to contact our firm today. COMMITTED TO GETTING YOU THE BENEFITS YOU DESERVE Workers' compensation is a state-run program designed to provide compensation to employees who suffer injury or illness on the job. If you have been injured at work, you should speak with an attorney about filing for benefits through the North Carolina workers' compensation system. To recover Workers' compensation benefits, you must establish two things: You were employed when the injury took place. The injury was a direct result of your employment. This means your injuries must have been caused by the tasks you were required to perform as part of your job. EXAMPLES OF WORKERS' COMP ACCIDENTS Construction accidents are responsible for the filing of many workers' comp claims each year in North Carolina. Ladder and scaffolding falls and falling debris are especially dangerous for construction workers. These types of accidents can cause severe head and back injuries. Workers also can suffer injury because of building collapses, radiation exposure, asbestos exposure and fires or explosions. Such accidents are capable of causing life-changing injuries, so victims should always talk to an experienced lawyer before filing for workers' compensation. TYPES OF WORKERS' COMPENSATION BENEFITS Workers' compensation benefits pay for current and future medical costs resulting from your injuries as well as lost wages. Many people who suffer an injury are no longer able to work, at least for a while. With the help of workers' compensation benefits, however, injured workers can continue to receive an income even though they are no longer able to work. You should be aware that if you apply for workers' compensation benefits, you can't sue your employer for additional damages in a civil lawsuit. NORTH CAROLINA WORKERS' COMPENSATION LAWYER At Lanier Law Group, P.A., we are committed to helping people throughout North Carolina take advantage of workers' compensation benefits. Our attorneys offer you: Personal attention. At the Lanier Law Group, P.A., you're a person, not a number. You work with an attorney whose goal is to help you receive the compensation you may deserve. Accessibility. With offices in Burlington, Greensboro, Greenville, Wilmington, Winston-Salem, Asheville, Fayetteville, Durham, Raleigh, Charlotte and Jamestown, you'll find an attorney close to you. We keep our doors open to help you when you need it most. Fierce defense. When you hire Lanier Law Group, P.A., you're hiring a heavyweight. We fight tenaciously on your behalf in boardrooms and courtrooms throughout the state. Whether your employer is obstructing your effort to receive benefits, your application for benefits has been denied or you simply need help in general, don't hesitate to contact an experienced North Carolina workers' compensation attorney at our office today. We help clients throughout the entire state of North Carolina, and have offices in Burlington, Greensboro, Greenville, Wilmington, Winston-Salem, Asheville, Fayetteville, Durham, Raleigh, Charlotte and Jamestown. WE HELP YOU UNDERSTAND WORKERS' COMPENSATION When you have been injured on-the-job, you may be unsure of what to do. It's likely that you have been forced to endure the costs of medical treatment and loss of income, so you should not hesitate to explore your rights to recover compensation from your employer through workers' compensation insurance. If your claim has been denied, you should know that this is not the end of the road. With the help of an experienced attorney from our firm, you may receive the compensation you may deserve, through appeals and a thorough investigation of your case. For additional information about the process of filing for workers comp and the benefits of doing so, visit our firm's workers' compensation website today. There you will find the resources you need to pursue your claim. AGGRESSIVE ADVOCACY FOR VICTIMS OF MEDICAL MISTAKES Medical malpractice affects thousands of Americans every year. While medicine is an imprecise science and the outcome of a procedure or treatment can never be guaranteed, there are still rules and protocols a doctor must follow when treating or diagnosing a patient. Medical malpractice occurs when a doctor fails to follow the accepted standard of medical care in his or her field of medicine and, as a result, injures or kills a patient. A medical malpractice lawsuit can be filed against any healthcare professional, including: Doctors Nurses Surgeons Anesthesiologists Radiologists Oncologists Dentists Hospital staff A North Carolina medical malpractice attorney at our firm may be able to assist you with any type of medical malpractice claim, including: Anesthesia malpractice Birth injuries Heart attacks Cerebral palsy Emergency room errors Failure to diagnose cancer Surgical malpractice Medication errors Wrongful death Pharmacy malpractice CONTACT A NORTH CAROLINA MEDICAL MALPRACTICE ATTORNEY Medical malpractice can reduce the quality of a victim's life for years, if not permanently. Victims of medical malpractice typically require additional medical care, ongoing physical therapy and many other costly treatments. Fortunately, the law entitles medical malpractice victims to compensation if they can prove the doctor or healthcare worker was negligent in his or her care. If you think you may be a victim of medical malpractice, you should consider speaking with an attorney about your legal rights and options. An experienced lawyer can review your claim to determine if malpractice was a factor in your injury. In cases of wrongful death, your attorney at Lanier Law Group, P.A. can help you obtain the compensation you may need to care for surviving family members. If your claim is valid, you can trust our experienced staff to help you file your claim against the appropriate party. We accept medical and pharmacy malpractice cases on behalf of clients throughout the state of North Carolina, and have offices in Burlington, Durham, Greensboro, Charlotte, Jamestown, Raleigh, Fayetteville, Wilmington, Greenville, Asheville, and Winston-Salem. We know how devastating a medical malpractice injury can be, which is why we make it our priority to help our clients recover compensation for their injuries, pain and suffering, medical bills and lost wages. With office locations in Charlotte, Durham, Fayetteville, Greensboro, Greenville, Raleigh, Wilmington, Winston-Salem, Burlington, Hickory and Jamestown, we are available to assist clients throughout the state. When you come to one of our offices, you will meet with a team of skilled professionals, including an attorney, a licensed insurance adjuster, and a paralegal. Together, we work as a team to help you settle your case efficiently and increase your chances of recovering the compensation you may deserve. We accept all types of personal injury and accident cases and can answer any questions you may have. Every case we handle is different. Not only are the circumstances and severity of every type of injury or accident different from one another, but also a client will have his or her own particular concerns, needs and questions that should be addressed. Because we focus on personalized attention and one-on-one service with our clients, we not only properly handle their personal injury claims but also work to bring them peace of mind in knowing that their case is in good hands. This is all a part of the attorney representation we provide. Contact a North Carolina Personal Injury Attorney You Can Trust At Lanier Law Group, P.A., we have almost two decades of experience in this area of law, and have honed our skills at litigating and negotiating these types of claims. With our intimate approach, we can evaluate your case to give you the best plan toward fighting for your desired outcome. You can trust us to advocate your rights to recovery, and employ all possible tactics to help obtain the compensation you need to get your life back to normal as quickly as possible. Above all else, our dedication and drive comes from a sincere compassion to protect our clients' best interest, and help them recover the compensation they need. Lisa Lanier was born in High Point, North Carolina. She received her undergraduate and law degrees from the University of North Carolina at Chapel Hill. Lisa worked as an associate for a large law firm in the Triangle for several years practicing insurance defense. 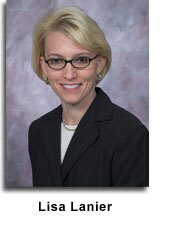 In 1995, she began her own practice concentrating on helping people with all types of injury claims. Since then Lanier Law Group, P.A. has grown to eight offices throughout North Carolina. Lisa is married and has two children. She has been a long distance runner for many years completing four marathons. She hopes to complete a fifth in the coming year.